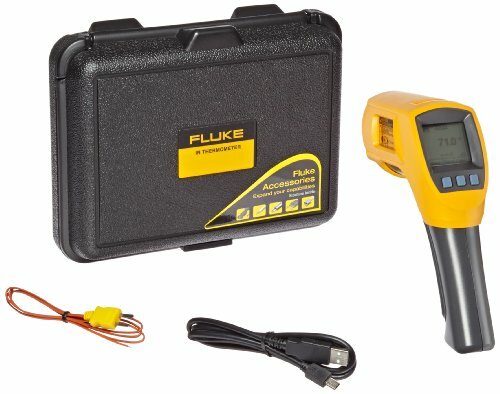 The Fluke 568 dual Infrared and thermocouple thermometer takes noncontact or contact temperature measurements in electrical maintenance and monitoring industrial and manufacturing processes. This thermometer measures temperature with the Infrared sensor from -40 to +800 Degrees C (-40 to +1472 Degrees F) with an accuracy of + or - 1 degree C (+ or - 2 Degrees F). it measures temperature with the included Type K bead thermocouple from -40 to +260 Degrees C (-40 to +500 Degrees F), and it is Compatible with standard Type K thermocouple probes (sold separately). it has a 50:1 Infrared distance-to-spot ratio with laser sighting for pinpointing the measurement area. The thermometer can store up to 99 points of data for analysis and monitoring on a computer. Its display shows the current temperature, the minimum, the maximum, the difference between the two temperatures, and the average temperatures when measured with the Infrared sensor, and it retains the last Infrared measurement for 20 Seconds after it has been taken. It has three emissivity settings that compensate for heat emitted from the surface of shiny objects to increase the accuracy of the measurement. Backlighting helps eliminate light Reflections and improves contrast in low-light conditions. The European Conformity (CE) marking indicates compliance with Applicable European union (EU) Directives. It comes with a Type K thermocouple bead probe, a hard carrying case, two AA batteries, a USB cable, fluke view forms software CD, and Instructions. This thermometer is suitable for measuring the temperature of equipment, systems, and processes in industrial, electrical, mechanical, and manufacturing environments.